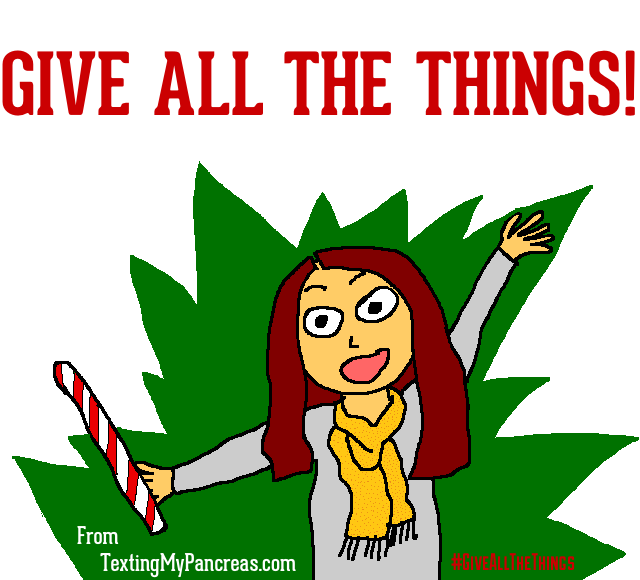 Texting My Pancreas: #GiveAllTheThings: Pharmacy Goodies. Meg: I went to CVS today. I love their storebrand items. Their version of tegaderm rocks! Welcome back! I hope you had a wonderful Christmas, or if you don't celebrate Christmas, I hope your random Tuesday in December was spectacular. In any event, there are four giveaways remaining in this Give All The Things shindig: here we go! 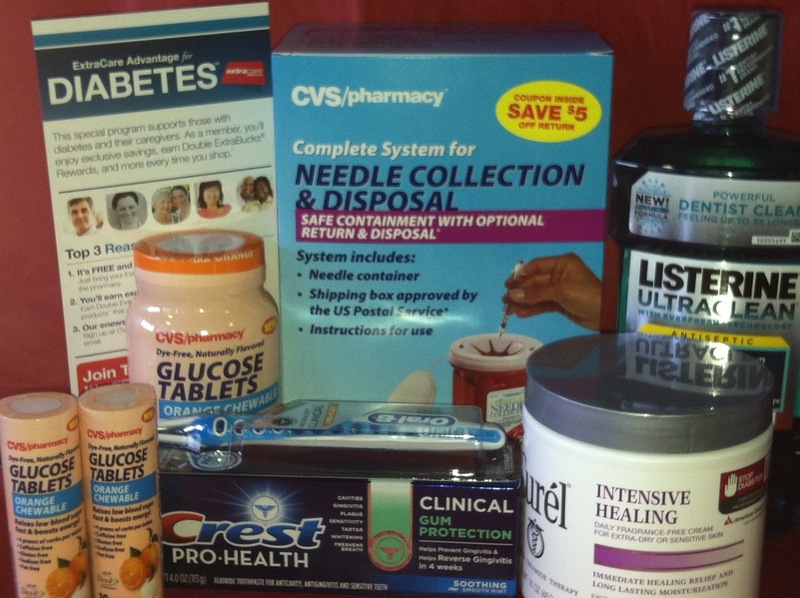 Products: A box of goodies to keep you healthy - teeth, skin, and blood glucose! Why you want this: Similar to the giveaway I hosted last month, this prize pack has great basics (glucose tabs!) as well as things you may not be buying already (legit sharps container! ), plus stuff you would have had to end up buying anyway (toothpaste!). You win all around with this one. And in case you aren't familiar with their diabetes-specific savings program (ExtraCare Advantage for Diabetes is the full name), new members of the ECAD program who sign up on CVS.com/diabetes automatically receive a $5 off coupon. Additionally, CVS/pharmacy is also offering a discounted $15 co-pay on a 30-day supply of CVS/pharmacy TRUEtest Strips, as well as a mail-in rebate for free meters. Excellent. To enter today's contest: This contest is open to U.S. addresses only. Please leave a comment on this post using the term "CVS" before 5:00pm CST, and I'll update this post shortly after that with the name of today's winner. Remember that these contests are intended for people with diabetes and their caregivers, only. Best of luck to you! I have to make a stop at CVS today..
CVS is the best place to get all your diabetic stuff. Do you have to go to CVS to win this? So does my question count? to win? It does. You're in the running! Thank you for offering this giveaway of diabetic supplies from CVS. Happy Holidays! I love all these giveaways and thanks to CVS for sponsoring todays. I have fond memories of the TRUEtest test strips. They were the test strips for my very first meter, which, of course, we got at CVS. I think I've only been to CVS maybe once. Maybe I should check them out. This stuff looks great! Insert witty acronym thats related to diabetes for CVS *here*. Thank you, Kim! Bryant the Dane sends Billy the Corgi Christmas smooches! I make a special trip to CVS to get glucose tablets; they taste SO much better than the ones some other pharmacies sell!! I feel like I live at CVS. I would love to win these goodies from CVS! New CVS are popping up all over here in my town. Would enjoy winning this stuff. The CVS that I go to is conveniently close to the brewpub. I am totally in. CVS rocks!! CVS no longer makes it a headache to go to the pharmacy! I heart CVS...it's my favorite drugstore & I get all my RX's there! CVS is the only pharmacy I go to. Their so friendly there. The pharmacist knows me by name. I just started shopping at CVS because one was finally built near to me. I am enjoying their specials. These CVS items are at a Clearly Valuable Store for diabetics! I went to CVS today. I love their storebrand items. Their version of tegaderm rocks! There is a brand new CVS 15 miles from my home. Haven't been there yet, but will soon! Wow, a diabetes pack? Too bad I didn't get to see this contest earlier; I wouldn't have needed to buy some cozaar for my cousin if ever.